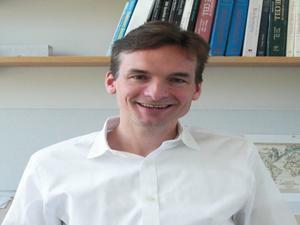 Dr. Benjamin Ebert, associate professor of medicine at Harvard Medical School and Brigham and Women&apos;s Hospital. Two teams of Boston scientists have discovered gene mutations that markedly increase the risk of blood cancer, an important step toward developing early detection and prevention strategies. Cancer is often the result of multiple DNA mutations that accumulate in cells over a lifetime, but scientists found that a subset were a telltale precursor of blood cancer, similar to a pre-cancerous polyp discovered in a colonoscopy. Healthy people with those mutations in their blood cells had an elevated 1 percent chance of developing blood cancer over the next year, the researchers reported in two papers published Wednesday in the New England Journal of Medicine. Ebert and others warned it would be premature to start screening people for the mutations because there are no known preventive therapies and the overall risk of developing blood cancer with the mutation remains small. The findings do, however, open the possibility of testing prevention strategies in people at greatest risk of developing cancer. They also may reveal something about how blood cancer develops and its relation to other diseases of aging. The gene mutations became more common with age -- they were rarely found in people younger than 40, but 10 percent of people over age 70 carried them. One of the studies found that people with the mutations were more likely to die of any cause over the next eight years. They were also more likely to have heart disease or strokes. “The really interesting thing about these studies is that the patients also, if they have these mutations, are dying, and dying not just of blood cancers, but of other things,” said Dr. David Steensma, an oncologist at Dana-Farber Cancer Institute who was not involved in the research. To identify the signature of cancer risk, the two teams took very different approaches. Ebert, who studies blood cancers, set out looking for warning signs in the genes of blood cells. His team studied the DNA of 17,000 people, focusing on 160 genes that had already been found to be mutated in people with blood cancers. They looked for new mutations that had occurred during people’s lifetimes and found that there were three key genes that carried the majority of mutations that increased the risk of blood cancer. Separately, a team headed by Steven McCarroll, director of genetics at the Broad Institute’s Stanley Center for Psychiatric Research, began with a very different goal: to understand the genetic basis of mental illness. McCarroll combed the DNA of more than 12,000 Swedish people -- half of whom were normal and half with schizophrenia or bipolar disorder -- to try and identify mutations that were more common in the people with mental illness. Instead, his team found that the genes with the most common mutations were equally common in both groups, suggesting they’d stumbled on genetic flaws that were not specific to mental illness. They quickly realized the genes were already known to be involved in blood cancer and began to measure how much the mutations increased people’s risk of developing cancer. This summer, the two groups learned about each others’ results and met to discuss their data. Physicians and scientists not involved in the research said the discovery is important for understanding how blood cancers develop and for studying prevention. The researchers believe that they’ve pinpointed initiating mutations that occur in stem cells that form blood cells. Alone, the mutations are insufficient to cause cancer, unless other cooperating mutations occur. Dr. Vincent Rajkumar, a hematologist at the Mayo Clinic in Rochester, Minn., said that for half a century, researchers have known of a protein in the blood that raises the risk for multiple myeloma. That protein increases risk for that one type of cancer by about the same amount as the mutations discovered in the new study. Despite knowing that the protein raises risk for the disease, doctors do not screen for that abnormal protein because there are no known interventions and the risk is still quite small. But patients do find out they carry the protein through blood tests and they often have questions and concerns. Rajkumar expects that as genome sequencing becomes more common, people will find out they carry the risk-raising mutations identified in the new study, too.